To see the 2019 calendar of meeting dates, guest speakers, and events for the Rogers County Master Gardeners, please CLICK HERE. To take a look at the calendar for Master Gardener events and meeting dates, committee workdays, as well as other organizations’ events and learning opportunities, please CLICK HERE. Find out the latest association news by reading our monthly newsletters. 2019 Master Gardener Spring Trip! The Master Gardeners are going on a spring bus field trip to the Tallgrass Prairie Preserve near Pawhuska with a stop at the Immaculate Conception Church in Pawhuska (Native American Catholic Church). WHERE: Meet at the Rogers County Building. TIME: Bus leaves at 8 am and will return around 5 pm. COST: $10 for Rogers County Master Gardeners and $20 for non-member guests. MG Association of Rogers County is picking up part of the expense for the bus. LUNCH: This will be either a box lunch at the Preserve, or at quick eatery in Pawhuska. A docent tour is planned for the lodge area of the Preserve. There is a small trail near the lodge for those who enjoy hiking. You may sign up for the bus trip at our Monday, March 18, 2019 general membership meeting. Please pay for the trip with cash or check at the sign-up. If you are unable to attend the Monday meeting and wish to secure a seat on the bus, please call Dora Johnson to add your name to the list. 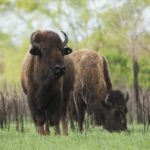 To read more about the Tallgrass Prairie Preserve CLICK HERE. Entries must be grown by the entrant in 2019. Entries may be submitted by 09/30/2019 at one of the MGARC meetings or by appointment at the Rogers County Building or by submitting a photo of the entry on an accurate scale (a weight watchers scale works for the lighter items and a digital bathroom scale for the melons will do). Photo must show scale, display, and veggie. Please submit to Ross by text or email. Watermelons, tomatoes and peppers will be judged by weight only. Sunflowers will be judged by measuring the seed head across its widest point (empty seed wells created by bird feeding will be included in the measurement). Oddly-shaped veggies will be judged in accordance with the fanciful notions of the membership in attendance at the October business meeting. Those veggies may be on display (at association meetings) during the growing season, but final judging will include pictures of the entries that matured earlier in the year. A Judge will be available with scales, tape measure and free comments within 3 days of a request. So please plan ahead in the case of a perishable item that won’t last until the next MGARC meeting. Entries may be discussed all summer. Winners will be announced at the October business meeting and certificates will be presented at the awards meeting in November. MGARC judges’ decisions will be final. Entries may be thoroughly examined (a theoretical 25 lb. pepper might cause the judge to look for a loaded veggie). In the event of an alleged 50# watermelon, an effort will be made to weigh the item at the entrant’s location. The contest is limited to MGARC members in good standing whom may enter any or all of the categories. Contestants may replace an entry with a better one as the season progresses (one time). The contestant with the winning entry in each category will receive recognition of that singular feat at the October and November MGARC Business meetings, and a Certificate of Merit detailing his/her accomplishment at the awards meeting.